More oatmeal?!! Oh yes, more oatmeal! 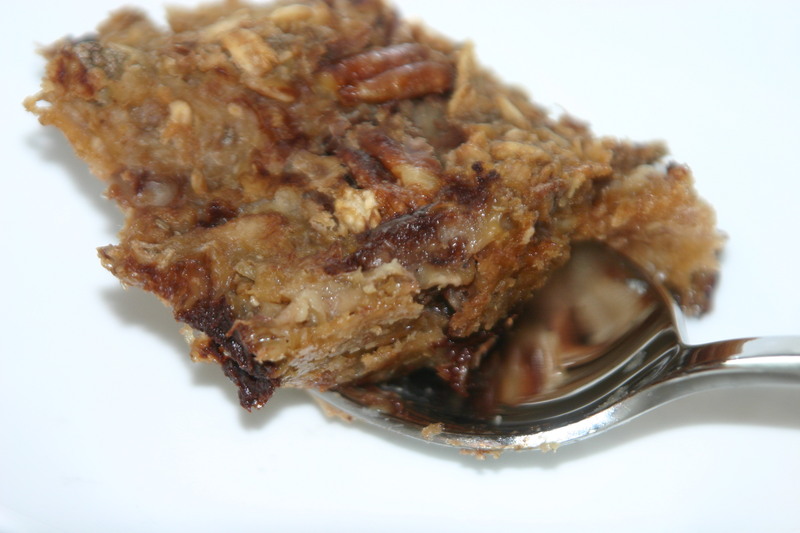 This one ventures into the land of baked oatmeal and it is so yummy!! This recipe is pretty darn close to this one from Vegan Yack Attack. It was so good when I made it I didn’t know how to improve it. A rare thing for me. It was also so good, I had to share it. This is a wonderful first vegan baked oatmeal. It holds together beautifully, is richly flavored, and makes you want more! I’m just posting the recipe without a discussion this time as we have been over oatmeal in depth. This is a baked version which I am just starting to experiment with myself. Good luck and happy eating. Stir together water, non-dairy milk, banana, sugar, chia seeds, vanilla extract, and salt. Mix in the oats, walnuts, and chocolate chips. Bake for 30-40 minutes, until the the top and edges are golden brown. I ate mine with just a little cold almond milk and it was superb! If you like you could also add maple syrup, more banana, or really anything that makes you happy.